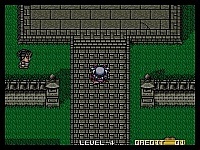 An RPG/Mah-jong game, this RARE title isn't the best game, but it is the latest game. 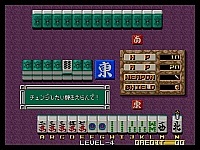 It's not a pure Mahjong game however, as it has many RPG elements. No wonder it didn't do so well in the arcades. 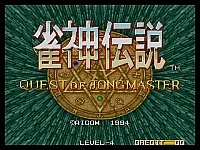 Graphics are okay, but it really isn't worth your time, unless you like hard Mahjong games that go nowhere. The graphics in this game seem decent. They aren't fantastic, but there are some nice pieces of artwork that you get when you meet different characters (see above screenshot), which means there is a little more variety than in most of the Mah-jong games on the Neo Geo. The soundtrack in this game is passable, but you will have forgotten what it sounds like about five minutes after you turn the game off. It's not all that memorable really.